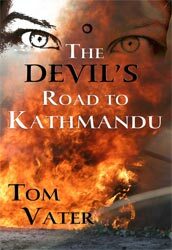 Tom Vater’s first novel, ‘The Devil’s Road To Kathmandu’, was published in Hong Kong with Dragon’s Mouth Press, an imprint of Orchid Press in 2006. Follow the drugs, the money, the past. An old hippie returns to Kathmandu after 25 years. The Devil’s Road by Tom Vater is a great read. It’s the story of three 1970s hippies driving a rickety bus overland from Europe through Afghanistan, Pakistan, and India to Kathmandu. Long on naiveté, short on funds, they get involved with a couple of young women, a mysterious Frenchman, a set of Siamese twins who work as cabaret singers, some holy men, and drugs. Big time drugs. The deal they strike in Pakistan, they think, is their opportunity to pay for the entire trip. But get in trouble when it all goes terribly wrong in Kathmandu and the money disappears. criss-crossing south and southeast on various assignments. He writes in English and German and specialises in strange tales and happenings. interview with the serial killer Charles Sobhraj (firmly ensconced in a Kathmandu prison). has been described as “a wholly enjoyable book, free of the pomposity that dogs many travelogues and… the antithesis of the coffee table book” (The South China Morning Post).